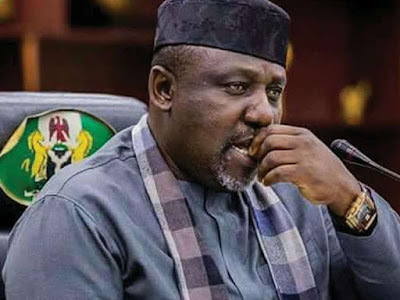 Imo State Governor, Owelle Rochas Okorocha, has ordered the suspension the Accountant-General of the State, Mrs. Stella Udogwu. Okorocha also ordered for the arrest of the Branch-Managers of Ecobank and Access Bank over the non-payment of November Salaries of the local government workers in the State. The suspension of the Accountant-General is with immediate effect. A statement signed by his Chief Press Secretary, Sam Onwemeodo, said that the governor had directed that the October and November Salaries of Workers in the State be paid at the same time in October. He added that the governor had thought that the directive has since been carried out accordingly, only to be told that the directive had not been adhered to. The statement quoted the governor as giving the directive when he attended an event to mark the 40th Year Anniversary of the Nigeria Union of Local Government Employees, NULGE at the Hero’s Square in Owerri. The statement said that the governor ordered that the November and December Salaries should now be paid on December 3, 2018, since December 1st and 2nd are not working days, and equally announced N10,000 each for the workers as their Christmas bonus and N2.5m as car allowance for each of the Local Government Directors of Administration and General Services. The governor said, “From today hence forth, there won’t be any need for any Local Government Worker to try to convert to the Ministry to be able to get to level 17 or become a Permanent Secretary. Today, I have officially lifted the embargo on Local Government Staff getting to level 17. Hence forth, Staff of the Local Government Civil Commission will be promoted to level 17 when they are due for it”. The governor said “An acting Accountant-General will be appointed with immediate effect and the Secretary to the State Government should direct anybody next to her to act immediately. Your salary must be released and your December Salary shall be paid immediately. All the interests from the salary kept in the bank must be collected and shared to the Local Government Workers who are the owners of the money, I order for the immediate arrest of the Branch-Managers of Ecobank and Access Bank with immediate effect”.